Welcome to the first day of Summer! If today is as hot as it is in NYC where you are, you'll enjoy cooling off with this refreshing cross between agua fresca and soda. For an even healthier version, use agave nectar to replace the sugar in the simple syrup. For those concerned about agave nectar's purity (that it may contain corn syrup): always read ingredients on labels, and take extra steps to seek out brands that are produced using only 100% pure agave plant with no additives. Prepare the simple syrup: Bring the water and sugar to a boil in a small saucepan. Add the ginger and stir. Turn the burner off and let the mixture sit until it is entirely cool. Remove the ginger and discard. 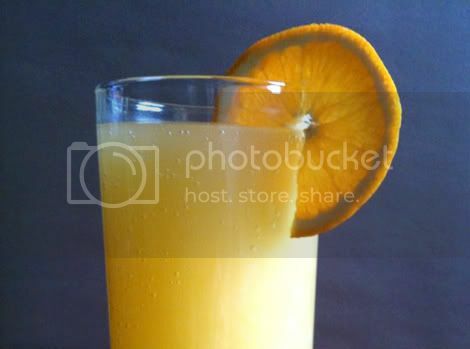 Make the Orange Ginger Fizz: In a pitcher, add the orange juice and simple syrup. Top with the sparkling water and stir. Pour into glasses, garnish with an orange slice and serve. Makes 2 - 4 glasses.